A group of Irish players will run out of the tunnel at Notre Dame Stadium just once more for Saturday’s home finale, but Will Fuller said it won’t be the last time for him. 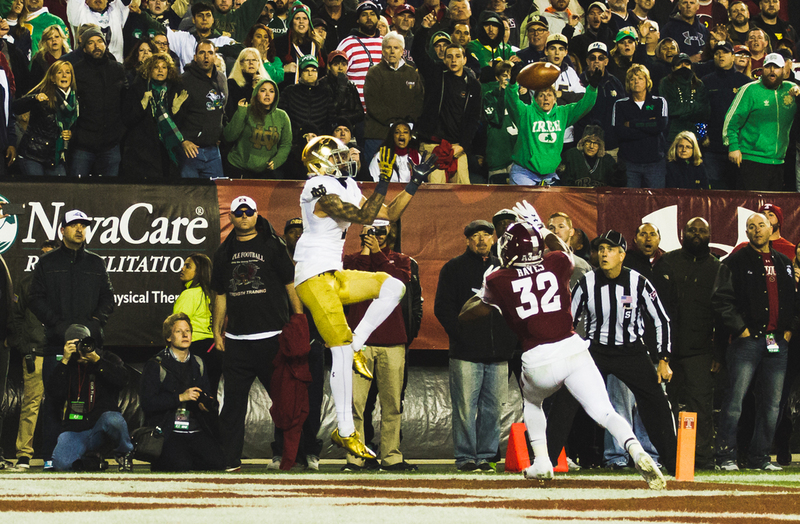 Irish junior receiver Will Fuller jumps to catch the game-winning touchdown pass with 2:09 left in Notre Dame’s 24-20 win over Temple on Saturday at Lincoln Financial Field in Philadelphia. The junior receiver said Wednesday he plans on returning to play his senior season at Notre Dame next year. “Yes. Yes,” Fuller said to reporters when asked if he will definitely be back in 2016. “I need to graduate. That is what I came here for,” he said. He also added that he had not told teammates or coaches of his plan. “I haven’t talked about it at all,” he said. Per NFL rules, underclassmen who have not used up their college eligibility but are three years out of high school may enter the league’s draft in April, with the NFL’s approval. The receiver, who was named to the 2015 Biletnikoff Award watch list, had been projected as a high 2016 draft pick on several mock boards as a result of his past two standout seasons. If Fuller does change his mind, he has until Jan. 15 to do so, the deadline by which all underclass players must declare their intentions to enter the upcoming draft.